In this guest commentary, the U.S. ambassador to the Holy See reflects on the projects and values the U.S. and the Vatican worked together on in 2018. One year ago, on Dec. 22, 2017, I had the honor of presenting my credentials to Pope Francis to serve as the 11th U.S. ambassador to the Holy See. It has been a privilege to serve in this important role. The United States and the Holy See share one of the most consequential diplomatic relationships in the world today. Our partnership, built on a strong foundation of trust and mutual respect, has advanced peace, prosperity and freedom. Over the last year, the U.S. Embassy to the Holy See has worked closely with the Vatican on a number of critical global issues, including religious freedom and human trafficking. Protecting the universal right of religious freedom is one of the priorities of our diplomatic relationship with the Holy See. In June, the U.S. Embassy to the Holy See hosted a symposium on religious freedom, which included participation by Cardinal Pietro Parolin, Vatican secretary of state, Cardinal Leonardo Sandri, prefect of the Congregation for Eastern Churches, and Cardinal Joseph Coutts of Karachi, Pakistan. And in July Archbishop Paul Gallagher, the Vatican’s foreign minister, represented the Holy See at the first-ever Ministerial to Advance Religious Freedom in Washington, D.C.
Over the past year, we’ve worked closely with the Vatican to support religious minorities who are persecuted simply for professing their faith. Last week, I had the honor of joining President Trump at the White House for the signing of the Iraq and Syria Genocide Relief and Accountability Act, which calls for humanitarian relief and other forms of assistance to religious and ethnic communities in Iraq and Syria who have suffered atrocities under ISIS. Protecting Christians and other religious minorities, particularly in northern Iraq, is a major concern for President Trump and Pope Francis. Tens of thousands of Christians have fled their ancestral homelands, as millions face pressures from violent extremist groups. In October, the U.S. government announced $178 million in additional foreign assistance to support ethnic and religious minorities in Iraq, bringing the total amount to $300 million since 2017. In addition to advancing religious freedom, President Trump and Pope Francis are committed to combatting human trafficking and modern slavery. The United States has a long history of working with the Vatican and other Catholic Church-related organizations on this endeavor. These efforts have been emboldened under President Trump’s leadership. It is estimated that more than 25 million people, many of whom are women and children, are victims of human trafficking. We see Afghan boys forced to fight for Iranian-supported militias in Syria; Rohingya refugees that flee persecution in Burma, only to be exploited by traffickers in refugee camps; and governments that routinely fail to stand up to traffickers and protect victims. The Trump Administration is committed to ending this global crisis through vigorous domestic and international initiatives. Leveraging survivor insight and expertise is central to these efforts. In June, Secretary of State Mike Pompeo recognized Blessing Okoedion with the Department of State’s 2018 Trafficking-in-Persons Report Hero award. I’ve had the privilege and honor of working with Blessing in Rome. Over the past year, the U.S. Embassy to the Holy See has partnered with the Vatican and Catholic lay organizations to implement international programs that assist trafficking survivors. Grant programs provided by our embassy have funded anti-trafficking training programs for Catholic nuns in 36 countries. Promoting the role of women religious leaders is another critical component of this effort. Earlier this year, First Lady Melania Trump honored Sister Maria Elena Berini with the State Department’s International Women of Courage Award. Sister Berini, a 73-year-old Italian nun, has served war-torn communities in Africa for the past four decades. The U.S. Embassy to the Holy See was proud to nominate Sister Berini for this award. Of course, the fight against human trafficking and the advancement of religious freedom are just two of the many areas of cooperation between the United States and the Holy See. Other areas include the support of interfaith dialogue, the contribution of humanitarian assistance and the promotion of peaceful solutions to crises around the world. When President Ronald Reagan and St. John Paul II established diplomatic relations nearly 35 years ago, they understood that together, the United States and the Vatican would act as a worldwide force for good. The U.S. Embassy to the Holy See looks forward to continuing this enduring legacy in the coming year. 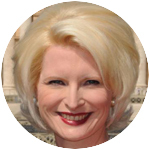 Callista L. Gingrich is the U.S. ambassador to the Holy See.